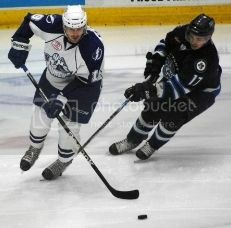 The Syracuse Crunch's recent slide is the result of a myriad of factors. After losing two straight games and six of their last seven, it is impossible for the Crunch to pinpoint one specific problem. With a little bit of everything to blame, the answers range from a mix of bad luck and tough opposition in net to defensive lapses and a lack of scoring. “We just haven’t been playing the way we want to play,” said Crunch forward Tyler Johnson. The Crunch hopes to remedy one of those problems, an absence of offense, by combining their top three point-scorers on the same line. With Tampa Bay Lightning prospects Johnson, Alex Killorn, and Brett Connolly practicing on the same unit, Syracuse hopes it becomes the team's slump-buster when Albany and Adirondack visit the Onondaga County War Memorial on Friday and Saturday. 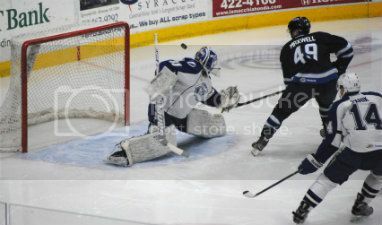 It was a night of firsts for the Syracuse Crunch. Vladislav Namestnikov notched his first professional goal and Cory Conacher registered his first Gordie Howe hat trick Saturday at the Onondaga County War Memorial. But unfortunately for the Crunch, the firsts didn't stop there. The St. John's IceCaps registered their first victory of the year after trailing at the first intermission, as the Crunch blew a 4-0 lead in a 5-4 overtime loss. "I wish I was a little happier about it," Conacher said of his achievement. "Maybe sometime down the road I can get it and get a victory out of it, too." As the Syracuse Crunch took the ice for warmups, they looked across the ice at something that gave them a range of emotions. It was different. It was weird. It was somewhat-familiar. It was the same bright blue, yellow and red Norfolk Admirals uniforms that most of the team wore last year during their amazing winning streak and ensuing run to the Calder Cup championship. "You step out and you're skating around and you see them coming out of their lockerroom, and you're like 'Jeez, those jerseys look pretty familiar,'" Crunch defenseman Mark Barberio said. "After that, it comes down to you're playing hockey and they're the opposition." 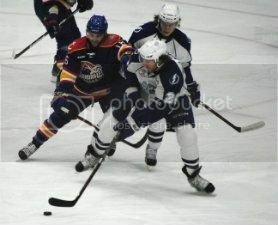 Syracuse, the new affiliate of the Tampa Bay Lightning, scored three power play goals in a 4-2 win over Norfolk, the former farm team, at the Onondaga County War Memorial Friday. 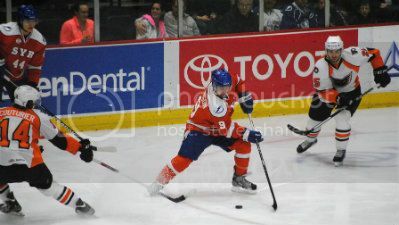 The Syracuse Crunch came out flat Friday, and the Adirondack Phantoms took full advantage. The Phantoms tallied goals on the first two shots of the game, and led 3-0 before the first intermission. The Crunch spent the rest of the game playing catch-up, and despite tying the game in the third, fell short in the shootout, 4-3, at the Onondaga County War Memorial. "It was a good comeback, the guys battled hard," Syracuse forward Tyler Johnson said. "But at the same time, we shouldn't put ourselves in that position. We shot ourselves in the foot."